Join Frenchie in this fun-filled art app that offers a wide variety of activities, colors, and backgrounds to make magnificent masterpieces to share. This is one app you don’t want to miss. Frenchie Draws is a unique art app that allows children to customize their artwork in a variety of ways before saving and sharing their magnificent masterpieces with others. In addition to the many utensils and paints there are various backgrounds, coloring pages, and games that will keep children entertained. Many art apps simply act as a blank canvas for users to draw and create their own works of art, but Frenchie Draws is so many other high quality images and functions that makes it stand out from the rest. The images and illustrations used for children to be able to color in and draw on are very well done. Not only are they simple enough for children to add their own flair to, but many of them are extremely creative as they go along with the breakfast theme. Frenchie (the french toast) is drawn with a beret and a mustache and his other breakfast friends have just as much personality. The sound effects each drawing utensil help to bring this app to life. Overall the developers have done a great job creating a high quality art app with fun illustrations and sound effects. In addition to allowing children to explore their artistic abilities, they also have the chance to practice writing and drawing their letters and numbers if they are practicing with a parent. Connect the dots and a spelling activity also allow children to practice spelling various words and counting. For an app that is mostly entertaining in nature, this app has some pretty good educational features. 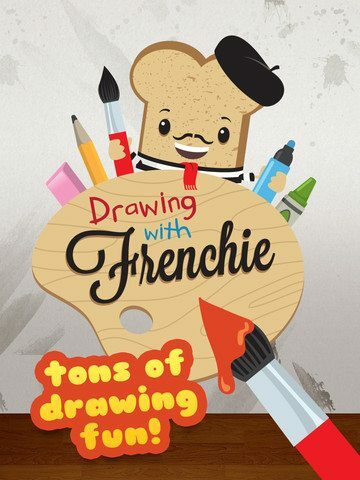 There are so many fun things to do in Frenchie Draws in addition to drawing and creating masterpieces. With 18 colors and 13 backgrounds to choose from the possibilities are endless, but when you factor in the 6 drawing utensils (chalk, pencil, marker, paintbrush, and crayon) and the added activities you find that this app has so much to offer. The added activities include many connect the dots pictures, illustrations to decorate and color, a matching game, find the differences activities as well as a few mazes to keep little ones entertained. There is also an option to take a snapshot of the image to share later. Images are saved on the device being used. Simply put this app is so much fun and offers something for everyone with the variety of activities included. It is hard to believe Frenchie Draws is so affordable, but it is. For just under two dollars you get a wide variety of activities, backgrounds, coloring pages, art utensils, and colors that will entertain children for hours. When you think of what you might spend buying all of the paper, coloring pages, and utensils in from an art store, this is a great deal. Not only are the images and coloring pages meant to engage children, but the user interface of this app is perfect for children. Without the need for instructions, children can move through this app exploring and creating their artwork easily. Parents can also appreciate the fact that there are no social media links or advertisements to worry about. With that said the main page does have “info” and “more apps” buttons that may allow children to access the developers website or the App Store once the new apps go live. Once children are in the app, there are no external buttons to be concerned with. Overall developers have done a great job of creating an app that is easy to use, safe, and entertaining.